If you are planning to buy a new garage door opener or you simply want to learn more about the leading brands, we've got some useful information to offer you. Opener technology has advanced in recent years, so we had our experts write this blog post to help you learn about the industry's top manufacturers and their latest creations. Many LiftMaster garage door opener models are able to integrate Wi-Fi technology, which allows them to connect to your home’s wireless network automatically. Once this happens, they can be monitored and controlled with an app which is designed for both smartphones and tablets, as well as for computers. You can get messages on the status of your door and open or close it remotely via the app. This will add to both the safety and overall security aspects of your home. 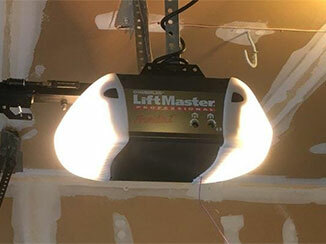 Other innovative features and accessories that LiftMaster models can come equipped with are the battery backup system, an automatic closing timer, a wall-mounted control panel with motion detection sensors and remote controls that use rolling code technology, namely the LiftMaster Security 2.0+ feature. This brand offers highly advanced belt and chain drive openers with internet connectivity. Another technology worth your attention is the tri-frequency radio system which they use, as it practically eliminates the risk of signal interference when you are using the clicker. It has a larger than the standard range too, so you won't have to keep getting closer and close in order for it to work. If you are not particularly fond of maintenance, just like most people, you will be happy to discover that the latest Craftsman openers have automatic force adjustment features. This is the first brand that started making radio controlled garage door openers. Its origins can be traced back to the early 1950’s. Currently, it is best known for its screw drive models, which offer very high opening speed (up to 12 inches per second), as well as the reliability of its chain and belt drive models. Another one of the advanced features the brand offers is the patented GenieSense monitoring and diagnostic technology. It ensures that your Genie opener uses the optimal amount of power at all times. This brand also uses rolling code technology like LiftMaster, but their trademarked version is called the Genie Intellicode.